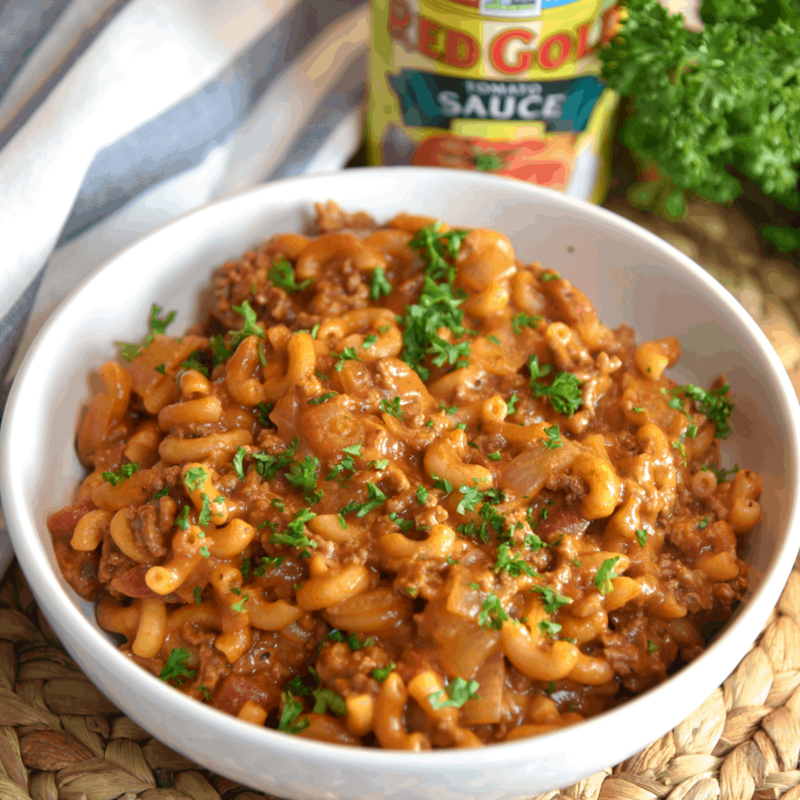 Old Fashioned Goulash is an easy, family-friendly meal that is full of beautiful tomato flavor. 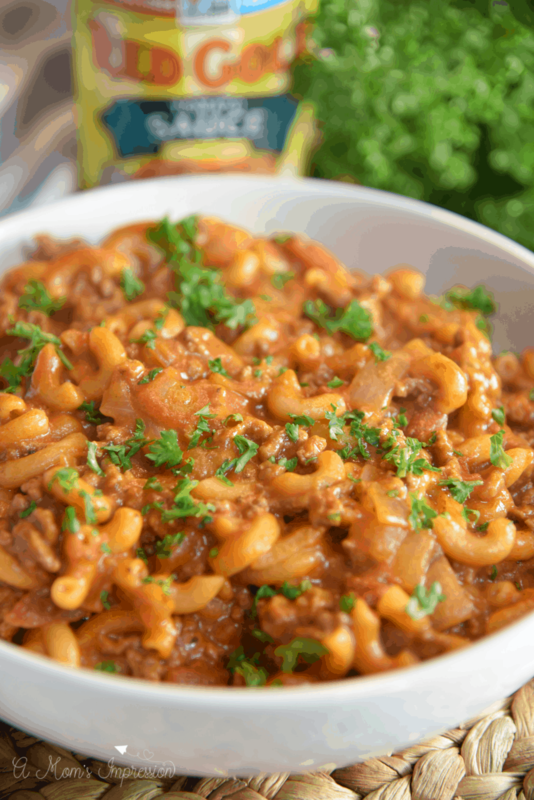 Made with ground beef, paprika, tomatoes, and macaroni this American Goulash is sure to be a big hit with everyone in the household for any day of the week. Thank you to Red Gold for sponsoring this post. All opinions are mine. Are your kids as busy as mine seem to be? I find myself running from dance class to gymnastics to basketball games to soccer several days a week. It is hard to figure out meals every night because we ar3e always on the go. 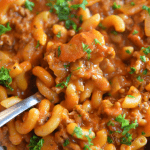 What I end up going with are tried and true recipes that my family enjoys like this old-fashioned goulash recipe. 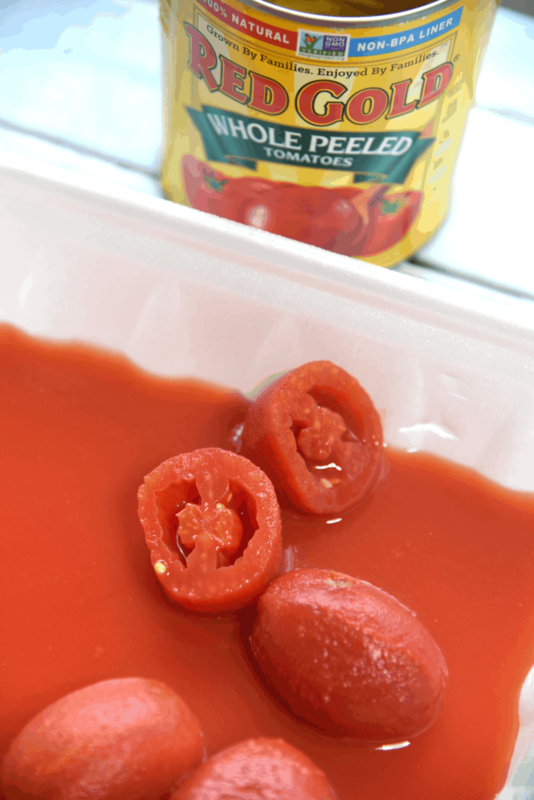 When feeding my family, it all comes down to using the best ingredients that I can find, which is why I use Red Gold Tomato products. 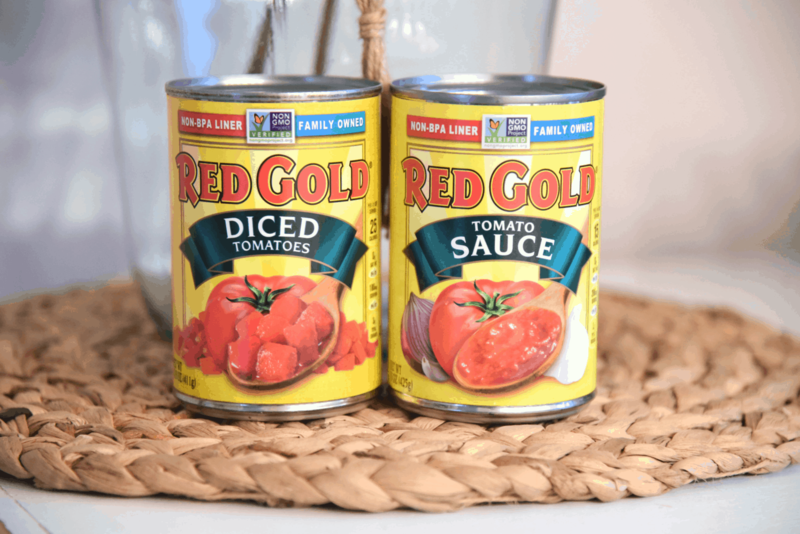 Red Gold Tomatoes are a family-made product, family-owned for 75 years, this company is passionate about quality to help you turn everyday meals into delicious family favorites. All of their products are Non-GMO project verified/packed in non-BPA lined cans! You can feel good about feeding Red Gold products to your family. 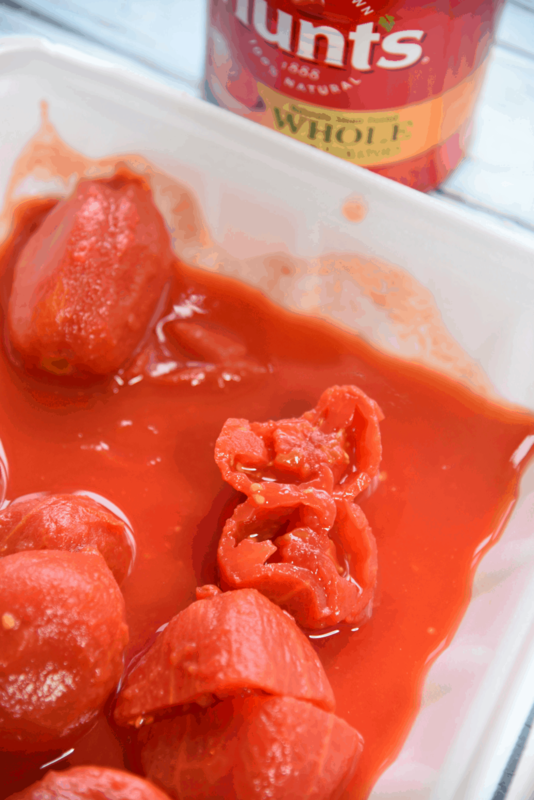 Red Gold stands behind their products and prides themselves on giving their consumers the highest-quality, freshest, best-tasting tomatoes. 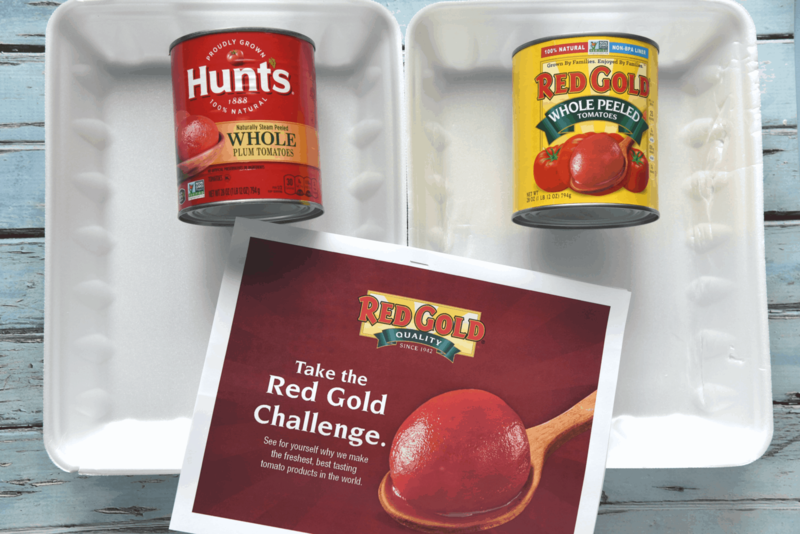 I was recently sent the Red Gold Challenge kit so I could see the difference between Red Gold Tomatoes and their competitors. 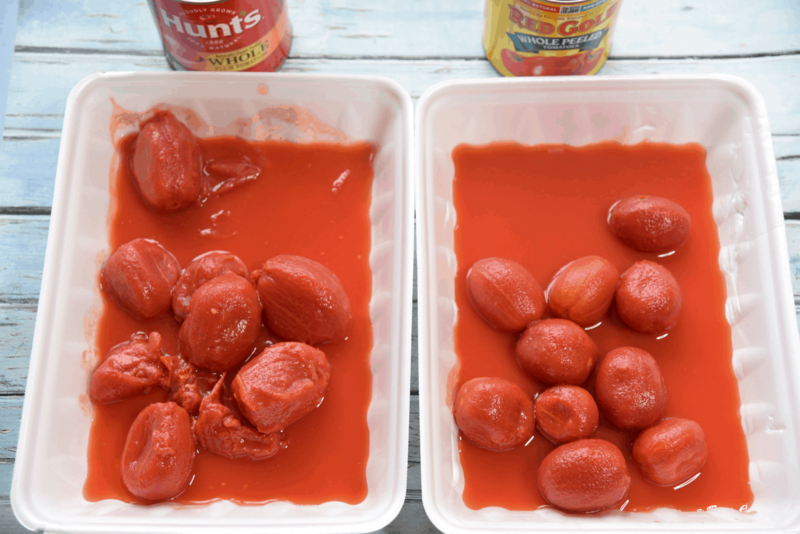 The challenge starts with cans of whole peeled tomatoes one from Red Gold and whole peeled tomatoes from their competitor. I opened each can and spread them into identical white cutting trays. I think you can see a difference right out of the can! Next, I cut a whole tomato in half to compare the differences. I noticed that the Red Gold Tomatoes held their shape much better than the competition. The difference is obvious, Red Gold produces a superior product. Goulash is traditionally a Hungarian dish that is highly seasoned with paprika. A Hungarian goulash is typically a soup or stew of meat like our Instant Pot Hungarian Goulash. Over the years it has been adapted to fit many different cuisines. 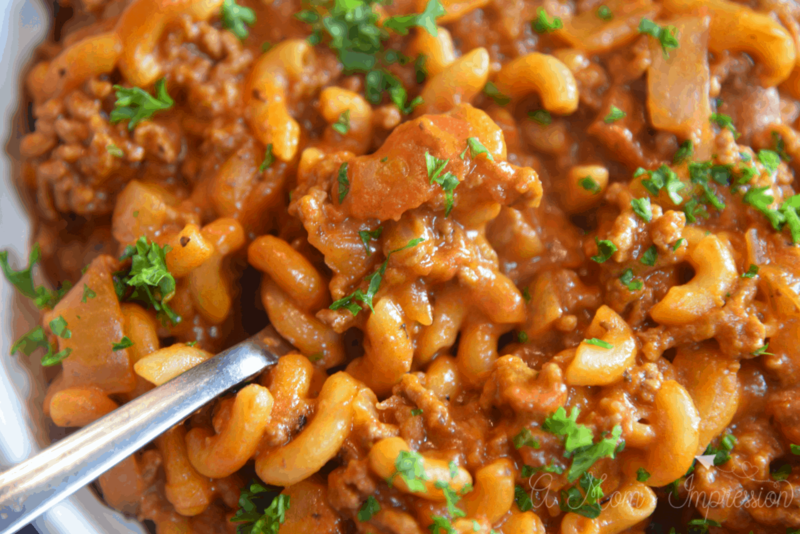 An American Goulash typically uses ground beef and macaroni. This is the version that I have grown up on and that I make for my kids most often. 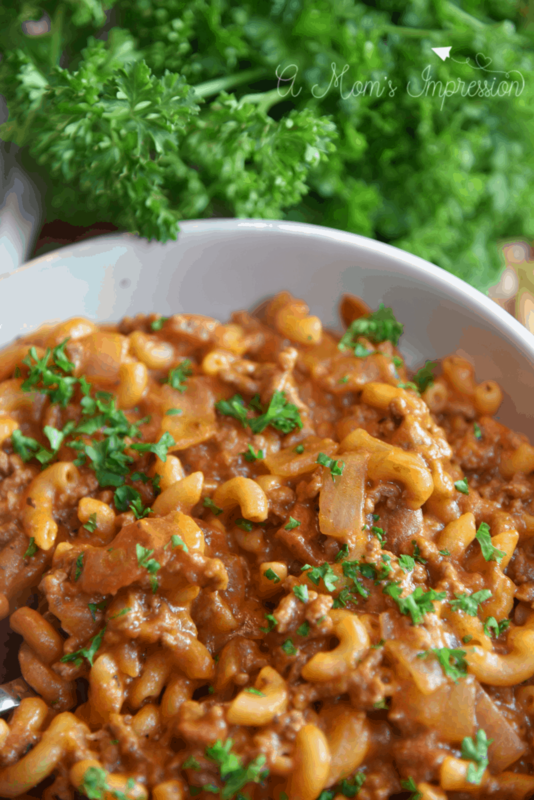 Goulash is made all in a single pot on the stove making it an excellent choice for those busy nights. One pot cleanup is just what this busy mom needs in her life! Plus, the leftovers taste amazing the next day! 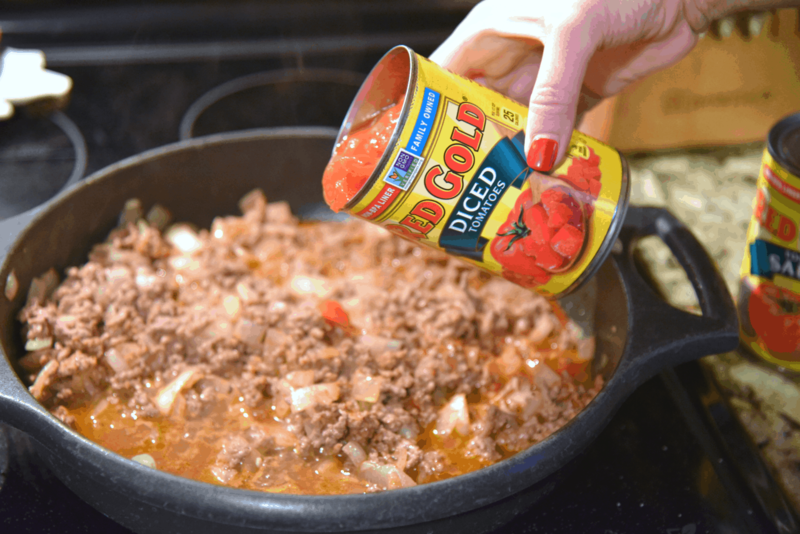 For more wonderful recipes using Red Gold Tomatoes, check out our Walking Tacos and our Sweet Potato Chili recipe. Preheat a large skillet over medium heat, add the oil. Saute onion until translucent, about 5 minutes. Add garlic and stir into onions. Add ground beef directly in with the onion and garlic and cook through, 6-8 minutes, drain. Add tomato paste to the skillet and stir to coat the beef mixture. Add broth, tomato sauce, diced tomatoes, and seasonings and stir. Add uncooked macaroni and stir again. Bring to a simmer, stirring occasionally, until pasta is cooked through, it usually takes about 15 minutes. Turn heat off and fold in cheese. Top with parsley if desired. Enjoy!